Limited editions. All the prints which are offered are strictly limited editions with individual print runs ranging from only 300 to 850 copies. Original signatures of racing stars. All the pictures are numbered and all are signed by Alan Fearnley with some also personally signed by the famous racing driver(s) featured. 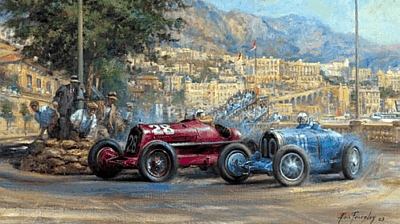 High-quality: These pictures are regarded as some of the best motoring art available because of the stunning use of colours and the attention to historical accuracy. Suggested framing option. We only supply the print so that you can choose the exact type, quality and colour of frame which suits yourself. But if you click here, you will get an idea of how one of Alan Fearnley's pictures may appear when it is framed. All the pictures are lithographically printed onto 300gsm acid free Paralux paper for the finest quality and will be supplied in a strong cardboard tube to ensure maximum protection. It is a wet and windy night somewhere in England. The train that has just arrived in the station has created an opportunity for the driver of the Jaguar Mk5 and his beautiful companion to enjoy the traditional cigarette during a brief encounter. Juan Manuel Fangio on his way to victory in the 1955 Argentine Grand Prix, followed by Ascari, Gonzales and Moss. 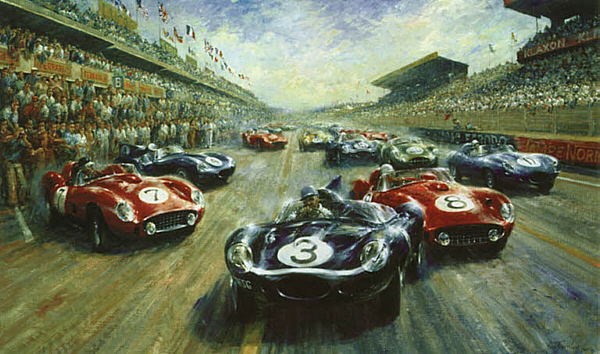 To commemorate the 50th anniversary of Jaguar's first win at Le Mans on 23rd-24th June 1951. The winning Jaguar XK C-Type was driven by Peter Walker and Peter Whitehead. The number 26 Aston Martin DB2 was placed 3rd and the number 9 Talbot Largo finished 2nd. David Coulthard in the McLaren Mercedes on his way to victory at the opening race of the 2003 season, Melbourne, Australia on the 9th March. Final touches of pleasure. A master craftsman completes another classic model in his private motoring den. Michael Schumacher on his way to his 16th Formula 1 victory driving a Benetton Renault. He started from 16th position in the 1995 Belgian Grand Prix at Spa Francorchamps on 27th August driving with mixed aggression and supreme skill to hold off a concerted challenge from Damon Hill.